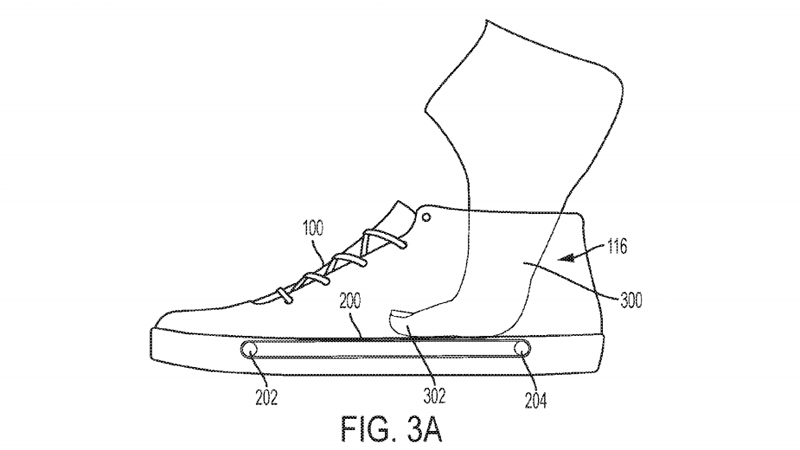 A recently published patent filed by Nike depicts a new “rotatable conveyor element” designed to help people put on their shoes. Essentially a tiny treadmill, the proposed device is a conveyer belt that’s embedded in a shoe’s insole and “configured to rotatably engage a body part of the wearer as the foot enters the space and draw the foot into the space,” according to the patent first spotted by Digital Trends. Interestingly, the patent suggests the treadmill device could be motorized and “coupled to an activation mechanism, such as a switch or mechanism to detect the presence of a foot.” The patent also mentions the possibility of a rechargeable battery paired with a kinetic energy generator, “such as a piezoelectric generator or other suitable power generation mechanism.” A footstep-powered, sock detecting mini-treadmill is likely just a concept, but such a device would likely be very well received by Nike fans who have difficulty putting on shoes the old-fashioned way due to, say, an injury, arthritis, or cerebral palsy. It should be noted that there’s no word on if or when Nike would make such a shoe, as many patents are filed without concrete plans to move on them.